Haddock, cod or pollock would all work well in this easy dish. 1. Preheat the oven to 200˚C, gas mark 6. 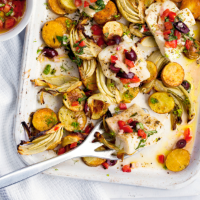 On a large baking tray, toss the potatoes and fennel with 1 tbsp oil; season. Spread in a single layer and bake for 20 minutes, or until golden and nearly cooked through. Place the fish on top, sprinkle with the crushed fennel seeds and season again. Bake for another 10 minutes, or until the fish is cooked through. 2. Meanwhile, for the dressing, pour the vinegar over the shallot; set aside for a few minutes. Add the tomatoes, basil, olives and remaining 2 tbsp oil; season and mix together. Pour over the hot fish, scatter with the reserved fennel fronds and serve.